Eating Raw in winter is difficult. The body craves carbs. About September, I start eating very heavy food (for me.) I anticipate the season and eat for the upcoming season. Right now, in Feb., I am eating more cleansing food. In late summer/fall, I double the amount of oil I eat and start eating roots and nuts. If I put on ten pounds, I'll easily lose it by Spring. I find it very hard to put on weight and am one of the few people who Brigitte Mars recommended for a diet high in fats. But be aware: I am 6 feet tall and 130 pounds. My son is 6'6" and 160 pounds and my father was 6'4" and 180 until he got old and went down to 150. I have a BMI of about 19 and very fine bones with short muscle body. My sister who has a large frame and much more muscle mass is heavier and must eat about twice what I do, being a jock. From my mother, I inherited early onset arthritis. Most of my diet is for one reason: pain management. The other part of it is because I have trouble eating anything, so much trouble that I seriously wanted to just give up eating about ten years ago; eating was a nightmare for me and I grew to hate most food intensely, but I still craved it--a very bad dependent relationship. This diet gives me no pain and makes eating pleasant for me. I prefer it to drugs. I also inherited all kinds of stomach problems from my father including a serious dairy allergy. I'm also allergic to the ENTIRE grain family, even sprouted grains. They aggravate my respiratory allergies and give me eye infections and asthma. This means corn syrup, sugar and also molasses, beer and almost all prepared food. Given that I also can't eat soy, most prepared food, especially vegan food is a no-go for me. I also have a very acidic stomach, so I can't eat pineapple and much in the way of fruits. I also have a serious citrus allergy and am allergic to coconut. The most common question I am asked is: "what do you eat?" Most nuts and seeds irritate my stomach acid. I don't find them hard to digest, but the pain after eating them is sometimes pretty intense. However, I found that eating acidic nuts in pestos or in salads tended to balance their acidic nature. I also do this with meat. Unlike most raw people, I do eat small quantities of meat, mostly fish and shellfish. This is a delightful dish that I developed over the years in the search for filling, non-dairy pestos for pasta. I had to give up pasta, but there are many, many substitutes for pasta you can experiment with. Some people dehydrate the "noodles" a little for an al dente texture; I don't have a dehydrator or the time to mess with this. Winter squash can be delightful raw, it can also be horrid. Again, know your families. Squash comes in four families. The most popular is Cuccurbita pepo which includes common pumpkins, zucchini, all those funky summer squash, acorn squash and delicata. Delicata is delicious cooked, but pretty boring raw. Many pumpkins are pretty vile raw except for a few bites while carving jack o' lanterns. Most of the squash available in the markets is C. pepo and I do not recommend any of it for eating raw. But you should taste it yourself; I find the texture does not appeal and they often have a very "pumpkin" taste that seems overpowering to me. The other down side of C. pepo is that they store well for about 3-4 months, but get dry and mealy. This is a great example of a lovely vegetable that cooks well and is not as great raw. After sampling other squashes for use as summer squash, I'm not even as sold on C. pepo in the form of zucchinis or yellow squash. But they are common in the grocery stores. Squash takes up a huge amount of space in the garden and are disease prone, so often buying them is a good option. If you have a farmers' market, getting squash can be a more adventurous experience. One of the better squash families that is more common on the East Coast and in Asia is Curcurbita maxima which has some of the better summer squashes in the form of banana squash and some of the more spicy tasting winter squashes like the Japanese form of buttercup squash known as Kabocha which looks like this photo of some buttercup squash. must be cured correctly to have the sweet, spicy taste that makes it delectable raw. 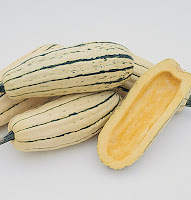 These squashes can be dry, tasteless and have huge seed cavities and almost no flesh by the time they hit the market. Again, they are a fabulous baking squash, but also good raw, unlike most of C. pepo. There are hundreds of varieties of squash, far, far too many to list here or evaluate in your own garden. The best place to "window shop" is Baker Creek Heirloom Seeds, a new company that has more varieties of squash, melons and gourds than any other seed company out there. They are also extremely friendly and may be able to point you to good squashes to try to grow and eat raw. Kabocha is one of the best, but it is erratic in the stores. The smaller squashes tend to be dry and seedy, but if you get a good squash, it is spicy and wonderful raw, just by itself. Grated winter squash, if it is good, is also something kids will devour raw with relish. The best family of the squashes for eating raw is Curcurbita moshata, more commonly found in the form of butternut squash. There are hundreds of varieties of this squash family. They usually have more meat than the other squashes. They vary quite a bit, but are usually darker orange in color. Butternut is usually available in common grocery stores. Try to buy organic squash; the common crop is heavily sprayed. 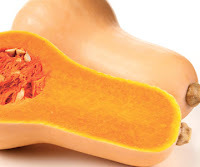 A good butternut squash will have a large neck and be reddish-tan without lesions on the skin. One of the great points of this squash is that it will keep until May, even June if you store it in a dry place at room temperature, not too hot. 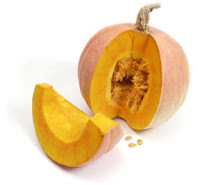 Butternut is very sweet, too sweet to eat with honey or brown sugar. Try giving it to kids plain before grabbing the honey. It will keep for a week in the fridge, longer if you cut off any of the exposed flesh that may get moldy. It is usually very juicy and easy to grate. I grate everything by hand, so I love easy to grate. Avoid the squash that looks beautiful but has a lot of ridges--you lose too much flesh. Here is a Ukranian squash from this family, note again the smooth, red-tan skin and the bright orange flesh. If you live in a climate hostile to squash, like where I lived in Florida (zone 10) it may be a challenge to get winter squash before disease and bugs do you in. A cure for powdery mildew is to spray the foliage with sour milk or sulfur solution BEFORE the onset of the disease. Once the plant gets it, it's too late. If you live in an area that gets powdery mildew, start spraying your squashes early. In Florida, I had a much better experience with growing gourds than with the Curcurbit family. Lagenaria is a bit bitter, but is very good as a zucchini substitute. 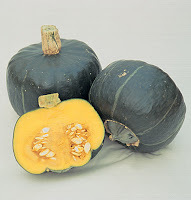 There are also many winter squashes in the Benincasa family, called wax melons and native to SE Asia. But on to the recipe. 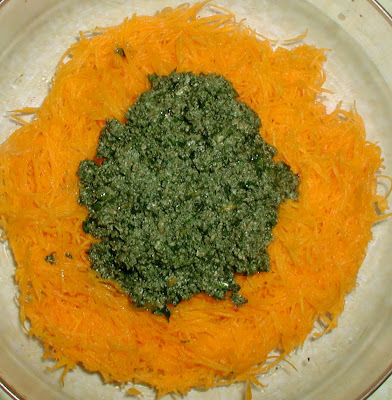 In the photo below, you can see the grated butternut squash. The color is vivid and appealing as a "noodle" substitute. It is juicy and sweet, but not as creamy or crunchy as noodles made of flour. I hesitate to call it a noodle substitute since is it just different. There are as many different toppings for squash as there are cooks. You can try a tomato sauce with garlic, fresh tomatoes and basil, or an Asian sauce of five spices and tahini. This is one of my favorites, a creamy nut sauce that can be made with dill, tarragon, or basil. I also put dried nettles in all of these sauces; along with kelp, nettles are something I eat every day. I have thin blood and kelp and nettles are the best treatment for it. They also help with allergies and have made my hair and nails about twice as thick. I also use a mortar and pestle (no blenders at our house) so my pestos and sauces tend to be more chunky. Mash or blend together the ingredients for the sauce and put onto the squash. This is a creamy, heavy dish that will satisfy even the winter blues. Also keep in mind that I don't really like to cook. All these dishes take about 15 minutes to prepare at the most.